Various types of speakers have the option to have a question and answer session. Keynote speakers generally do not have the time while speakers who are facilitators, trainers or who can speak longer, have a question and answer session. 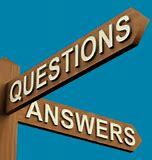 For the audience, they can ask questions to clarify or get more information on what was said. For you as the speaker, you can answer questions and tie up any loose ends that your audience may have. To start the process, assume your audience has questions. Ask your audience what questions do you have, then wait. Some speakers do not show patience and if no one asks in the first couple of seconds, they begin to move on to the next portion of their program. Give at least 10 seconds, which may feel like a minute. Keep the pause, for generally once the first question is asked, people will begin to feel more comfortable and follow suit asking questions. When someone asks a question, before you answer, repeat the question so that everyone in the room knows what the question is. If you do not know the answer, say so. Never bluff. The audience can always tell.